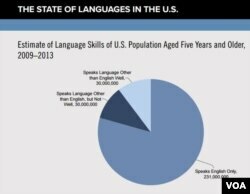 Educating Americans in a language other than English is failing, according to a new report. "The United States has neglected languages in its educational curricula, its international strategies, and its domestic policies," concludes the American Academy of Arts and Sciences. More than 230 million English speakers in the U.S. have failed to learn a second language, says the "State of Languages in the U.S.: A Statistical Portrait" report from the Cambridge, Massachusetts-based academy. The number of U.S. residents who speak a language other than English at home is growing. But that is mostly among immigrants and their offspring, the report states, and only 20 percent (or 60 million residents) of the population. Among households that speak a language in addition to English, 57 percent were foreign born and 43 percent were born in the United States, the report states. Spanish is the second-most spoken language in the U.S., among 12.6 percent of the population. U.S. residents speak more than 350 other languages according to U.S. Census Bureau data, they are spoken in far smaller proportions: Chinese, 0.9 percent; Hindi, Urdu, etc., 0.7 percent; Filipino Tagalog, etc., 0.6 percent; Vietnamese, 0.5 percent; German, 0.4 percent; Korean, 0.4 percent; French, 0.4 percent; Arabic, 0.3 percent; Russian, 0.3 percent; Italian, 0.3 percent; Portugese, 0.2 percent; Haitian Creole, 0.2 percent; Japanese, 0.2 percent; and "all other languages, 2.2 percent. The report explains that in many regions, 95 percent of the population speaks English only. In other regions, "a language other than English is the primary language for more than half the population." In languages that immigrants being with them to America, language proficiency drops rapidly in a few generations. When immigrants arrive younger than 13, 45 percent continue to speak and understand their "heritage" language well, the report says. By the third generation, only one-tenth could speak in their heritage language. "By the third generation, less than 9 percent remained balanced bilinguals," it states. The AAS points to a lack of language instruction in schools as the lack of multilingualism in the U.S.
"A dwindling number of the nation’s schools offer any language education. In academic year 2007/2008, 25 percent of elementary schools taught languages other than English. This marked a six percentage point drop from 1996/1997, with the largest decline at public schools." In the 1997 census, 31 percent of public elementary schools taught a second language. A decade later, those lessons had dropped to 25 percent. Today, 15 percent of public elementary schools had a program for languages other than English, "compared with more than 50 percent of private elementary schools (which teach a small fraction of the nation’s elementary school students)." But "American businesses have reported a need for employees who understand the nuances of communicating with the international community, and the federal government continues to struggle to find representatives with enough language expertise to serve in diplomatic, military, and cultural missions around the world." "While English continues to be the lingua franca for world trade and diplomacy, there is an emerging consensus among leaders in business and politics, teachers, scientists, and community members that proficiency in English is not sufficient to meet the nation’s needs in a shrinking world. The percentage of children learning a second language in elementary school in the U.S. is 21.5 percent. In European primary schools, more than half were learning another language in 2014, the report says. A future AAS report will examine "the disparity between our goals — most notably the preparation of citizens who can thrive in the 21st century — and the nation’s current capacity in languages," the report concludes. Have you noticed that fewer Americans speak a second language? How do you think that will impact America's future, or your future? Please leave a comment, and visit our Facebook page, thanks!